The following post is from author and storyteller Ethan Bryan. My nephew has a cerebral palsy as a result of a very rare congenital malformation. After learning of his diagnosis, my sister and brother-in-law searched online looking for support and stories of others with similar stories. They found Go Shout Love (www.goshoutlove.com). Go Shout Love features stories of families who have children living with rare illnesses and designs t-shirts to help raise funds to support those families. (Unfortunately, Go Shout Love no longer is operating as a business.) My sister was exploring the site when she found the story of Bo Macan. “Do you know him?” my sister asked in an email, with a link to Bo’s story. I clicked the link and read Bo’s story and that’s when the crazy idea hit. I should write a children’s book about Bo. The idea was so loud and so strong and so completely unexpected. The only thing I knew about children’s books was they require illustrators. I can barely draw passable stick figures. But I know myself and I knew this idea would not leave me alone, so I took the next step. I know this sounds weird, and I’m not exactly sure how to go about it. But…What if I wrote Bo’s story as a children’s book and then found an illustrator and then sold copies of the book to help with your medical costs? Would you and your family and Bo have any interest in that? I thought that would pacify the idea. Yes! How in the world did you find us? Over the next week, through emails and phone calls, I learned more about Bo and his journey. I, too, am a big Royals fan. I, too, loved watching Bo Jackson play. And that’s when the storyline idea hit. I spent hours trying to find a way to connect with Bo Jackson, knowing I’d need his approval to move forward. I sent dozens upon dozens of emails to all kinds of websites and heard nothing in response. And then, one afternoon, I got an email. I spoke with Bo and he is fine with you including his story and image in your book. We would need to see the image and story prior to publication to approve. I then contacted the Kansas City Royals to learn about the process for getting approval of using the Royals logo in the story, and they put me in touch with lawyers and Major League Baseball. And both the Royals and MLB were incredibly helpful and generous in answering questions and offering advice. Only one problem remained: I still couldn’t draw. I still didn’t have an illustrator. So I contacted my alma mater, which I cannot help but call Southwest Missouri State University, and sent an email to the graphic design department, wondering if any seniors needed some kind of last semester project before graduation. The head of the department replied and let me know he’d pass along word of my story to his students. A few days after that, Wilson sent me an email containing a link to his portfolio. We agreed to meet at a coffee shop and visited and he graciously agreed to tackle the illustrating side of the project. And that is how They Call Me SuperBo started. Every single step of the process was intimidating and filled with great ignorance. Wilson not only illustrated, but helped sharpen the storyline. His illustrations were perfect for the project. The Royals and MLB were patient in answering questions and helping navigate the legal issues of licensing and publication. Goldminds Publishing generously agreed to bring Bo’s story into the world. 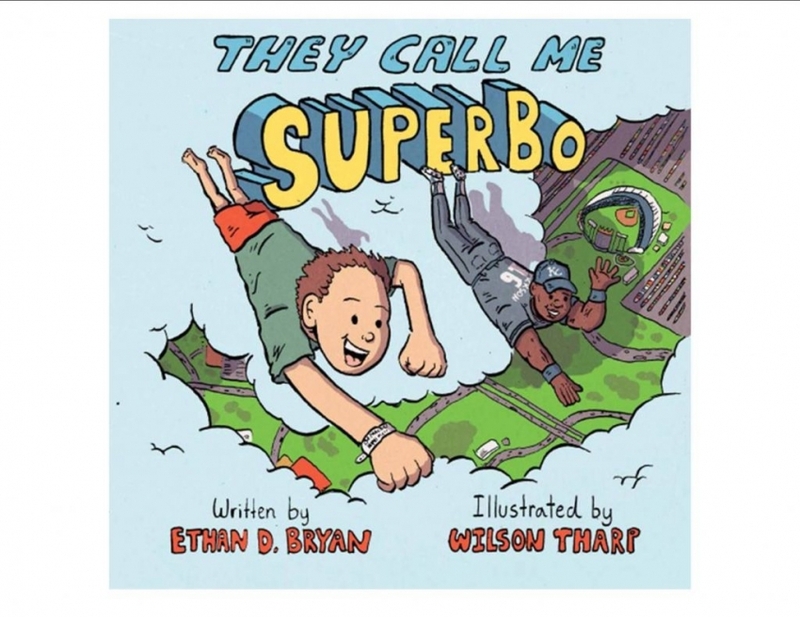 They Call Me SuperBo will have a one-time print run with all proceeds benefitting the Macan family. To order a copy, make a donation via this website before Thanksgiving (http://macanithappen.com/make-a-donation/). The cost of publishing the book is around $7. I’d recommend a donation of $20. The books should be available in time for Christmas. Or New Year’s. Definitely before Opening Day. My favorite line in the book comes on a two-page spread near the end. Life is full of serendipitous encounters and incredible opportunities. Sometimes they start with an idea so loud that you cannot ignore it. Thanks to this idea, I have made several new friends, and that is something to be truly celebrated. Ethan D. Bryan loves to write stories about baseball and life. He has published six books, including one other children’s book, and is currently working with Baseball Seams Company on a new project, “America at the Seams.” He is still trying to find a way to play baseball for the Kansas City Royals. To see more of Wilson Tharp’s art: http://wilsontharp.com/. To see other books published by Goldminds: http://www.goldmindspub.com/.